The perfect vacation is waiting for you at La Chiripa!! La Chiripa is a spacious, ocean front home in Cayucos with a large multi-level private patio. Bright and airy single level 3 bedroom 2 bath home located on desirable Studio Drive with the sandy beach just steps away. La Chiripa has a private gate to the public beach access. 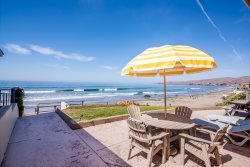 Find yourself relaxing on this beautiful patio where the views will stretch from Morro Rock and past the Cayucos pier or gather around the fire pit for a perfect Cayucos evening. La Chiripa has a very family friendly living room with lots of seating for everyone. Warm up by the fireplace after a quick dip or take a siesta in the sun on the strategically placed ocean view futon. Open floor plan with ocean views from kitchen, dining room and living room! Guest accessible 1 car garage, 1-2 on property additional parking. Master bedroom has views of the Pacific Ocean and private walkway to oceanfront patio. Come experience La Chiripa and all that it has to offer – perhaps a stroke of luck! Staff was great. Very accommodating. Overall great experience. Back patio was especially enjoyable with lots of space.